STEM For Kids’ footprint growth continues with the launch of Washington East Side territory. 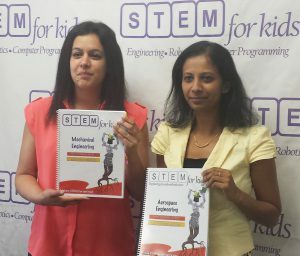 After 20+ cumulative years working in technology sector, engineers Sweta Kishore and Suhasini Varadhan partner to bring STEM For Kids to the Greater Bellevue area east side of Seattle. Sweta with her curious and inquisitive mind was driven towards innovation and design from her early childhood. Her juvenile attempts at making a hot air balloon, a raft and a tree house propelled her towards a Bachelors in Mechanical and Masters in Industrial Engineering. Suhasini, who is a Masters in Electrical Engineering, discovered from her experiences with her two inquisitive children that project based learning (PBL) is more engaging and effective for STEM based concepts. ” the essence of education is not just imparting wisdom but to invigorate the pursuit of knowledge. The environment we set for learning is a very important foundation, in a child’s education. …in today’s world we need our children to learn how to think not what to think!”, she says. “I strongly believe that educating students in STEM subjects prepares them for life, regardless of the profession they choose. Those subjects teach students how to think critically and how to solve problems — skills that can be used throughout life to help them get through tough times and take advantage of opportunities whenever they appear”, says Sweta. The duo join hands in franchising the proven STEM For Kids system to set their beliefs in action and bring the excitement of STEM to their community. “With the broadest array of engineering, computer programming and advanced manufacturing programs for children in preK-8, STEM For Kids is making Science, Technology, Engineering and Math fun and real around the world. We are excited to have Sweta and Suhasini team up to lead the STEM front in Washington”, said Moni Singh, President of SFK Franchising Inc.
National and international franchise opportunities are available for single and multi-units. Entrepreneurs with a passion to impact their community through education can learn more and apply at the STEM For Kids website, stemforkids.net/franchise or call +1 866 991 7053.